Dr. Banyard, veterinary dental specialist in Chiilwack, can treat dogs and cats with jaw fractures. Trauma such as falling from a upper level apartment, being hit by a car, gun shot wounds or being bitten on the face by a large dog can result in fractures to the jaws. After the patient has been stabilized and treated for life threatening injuries, the jaw fractures and tooth fractures can be addressed. Often such injuries will cause the jaws to not be able to meet. The jaws need to be set so that the teeth are back into alignment so that the pet can eat properly. These are very painful conditions. Treatment is needed as soon as possible. It is very important to see your veterinarian for this problem. 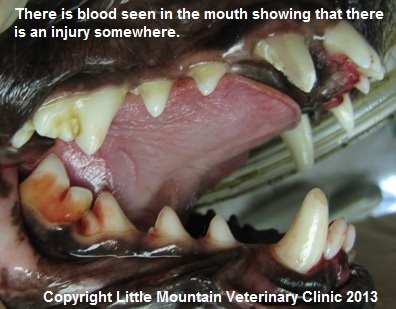 Treatment of the fracture by a veterinary dental specialist who has the necessary training is recommended.